As Bevo arrives in Dallas ahead of Saturday's Red River Rivalry game, it's worth remembering that longhorn cattle might have gone extinct nearly a century ago but for the quick actions of some federal employees, who assembled a herd on an Oklahoma wildlife refuge. The Texas longhorns owe their survival in large part to Oklahoma. Oklahoma and the federal government, that is. We’re talking cattle, of course, not football. Here’s what happened: A century ago, the longhorn breed teetered on the edge of extinction. After the Civil War, the great herds that had lumbered up the Chisholm Trail from Texas to the railways depots in Kansas for shipment east had suddenly fallen out of favor. Texas ranchers had become enamored with Herefords and Angus, which grew faster and were often less cantankerous than the lean, hardy longhorn, which was descended from Spanish and Anglo cattle and had sometimes roamed wild. The arrival of barbed-wire fences, which blocked off long stretches of the Chisholm Trail, helped seal the longhorns’ demise. The longhorn became so rare that zoos got interested in keeping them. Articles appeared with with headlines like “The Texas Longhorn’s Dying Bellow.” The Longhorn was “nearer extinction than the buffalo ever was,” according to a 1926 resolution by the Texas Folklore Society, which worried that the fabled breed would be lost. Forest Service employees Will C. Barn[e]s and John Hatton, armed with descriptions of the longhorn "type", set forth on a 5,000-mile search for typical animals. After inspecting more than 30,000 head of Texas cattle, a herd of 20 cows, 3 bulls, 3 steers, and 4 calves was assembled, and in August 1927, was shipped to the Wichita Mountains Wildlife Refuge (then the Wichita National Forest and Game Preserve). That preserve is in Oklahoma. It’s less than 90 miles southwest of Norman. That first herd arrived at the Wichita Mountains in 1927, and Barnes extracted $3,000 from Congress to care for the animals. And so the longhorns avoided the fate of the California golden bear, a grizzly that went extinct there in 1922. Instead, like the buffalo, the longhorn was saved. Most Texas longhorns today bear genetic traces of the Wichita Mountains herd, according to Laura Standley, who edits Texas Longhorn Trails, a magazine published by the Texas Longhorn Breeders Association of America. 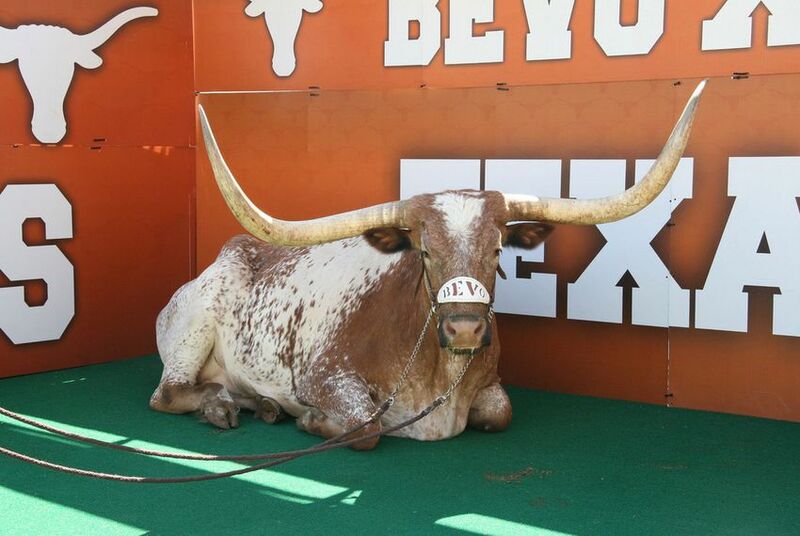 John T. Baker, the owner of the current Bevo (#14), said his records of the steer’s bloodlines date back only to 1964. But it is very possible, he said, that the steer had ancestry from the Oklahoma refuge, which still keeps a longhorn herd of about 285 head. A Texas longhorn preserve was established in the 1930s, when the state realized that it, too, should act to save an iconic symbol of its past. Oilman Sid Richardson put up some cash. “You gather up the Longhorns to form a state herd; I’ll pay for them,” Richardson told cattle expert J. Frank Dobie, according to an April 1952 article in The Cattleman magazine. The herd was largely gathered in East Texas, but eventually it was joined by some bulls from the Oklahoma refuge. Since then, the longhorn has made a comeback. More than 250,000 head are registered across the United States, according to Standley of the longhorn breeders association. The longhorns are also lean, which makes them suited for modern health sensibilities. “You can’t make longhorns fat,” said Mike Crawford, owner of Red Peak Ranch in Mills County. Their leanness helped them get up the Chisholm Trail in the decades after the Civil War, in what Don Worcester, author of The Texas Longhorn, described as "the greatest movement of cattle in history." Fatter cattle could not have made the trek. Longhorns are often found in hamburgers and other generic supermarket meat, but Crawford and others such as Bandera Grassland have recently started marketing grass-fed longhorn steaks. Crawford’s operation, which other ranches participate in too, is called Chisholm Trail.